Light Us Stylus with 3-in-1 features a stylus, pen and LED light. No need to carry 3 different things just take this 3 in 1 Light Us Stylus and flip it to use either feature. It is all metal body and lightweight just like a normal pen. It also has a nice strong grip that makes using any features easy. The LED light works on push tip for on or off action. This comes handy in restaurants to read menu or to focus light in dark or small areas. 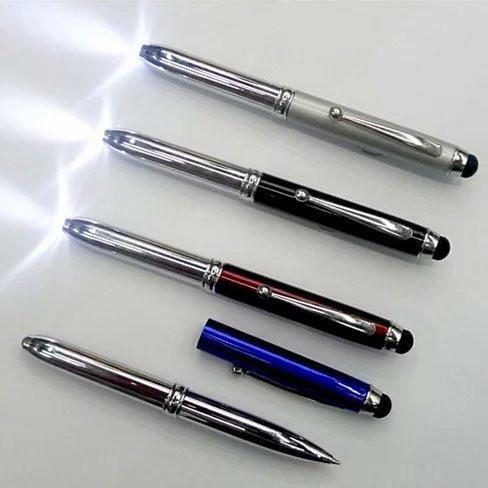 Features:• Stylus with smooth touch sensitive tip for any touch screen.• Easy gliding Ball point pen in blue ink with replaceable ink cartridge, available in any office supply stores.• LED light with Tip push on/off, with replaceable button battery.• Comes in multiple colors.